Larnaka, which is the 2nd largest commercial port for the country of Cyprus, now has its own 123 Refills store. This is the 3rd ink and toner refill store opened by 123 Refills in Cyprus, which has a total population of around 750,000 people. Stores have been established already in Limassol and Lefkosia (Nicosia). The total number of stores that offer the 123 Refills line of inkjet and toner cartridges and ink refill / toner refill services in Cyprus is three, with another store in development plans for the city of Paphos. 123 Refills is proud to welcome the Larnaka store to its international portfolio, bringing the total number of 123 Refills locations to 32 worldwide. 123 Refills is exhibiting its franchise model this weekend in Athens, Greece. Greece was the springboard for the brick and mortar franchise expansion of 123 Refills. The concept was founded in the USA, but having grown through franchise expansion in Greece and Cyprus, the expansion of the franchise brand is now continuing to other parts of Europe and the Middle East. Malta recently opened its first 123 Refills store, and more stores are in development for Saudi Arabia and Kuwait. Το να κερδίζουμε λεφτά απο την ανακύκλωση των μελανοδωχείων... Δεν σημαίνει ότι θα πρέπει να συμβιβαζόμαστε με χειρότερη ποιότητα. Στην 123Refills η μοναδική τεχνογνωσία μας τριών σταδίων στο ξαναγέμισμα εξασφαλίζει ότι τα προιόντα μας θα συμπεριφερθούν ακριβώς όπως και στα αυθεντικά. Η 123Refills παρέχει στούς πελάτες της 100% γραπτή εγγύηση γιά όλα της τα προιόντα. 123 Refills in downtown Los Angeles will soon be moving to a new and exciting location just across from the current location. The new location is across the street and next to 7 Eleven (which is at the corner of Olive and 7th Streets). The new address is 705 A South Olive Street and will continue to offer on site ink refills for popular ink models, as well as off-the-shelf remanufactured and compatible cartridges for all printer models (ink, fax and toner). OEM (original equipment manufacturer) brand cartridges will also be for sale. Save an average of 50% and enjoy the convenience of buying in store! Visit us at our new location. The first 123 Refills store in Malta, Europe, is open as of January 2010. Located at 197, Naxxar Road, San Gwann (in front of HSBC), 123 Refills is now offering its low cost and high quality ink and toner refill services and cartridges to the residents of Malta. The store map is located at: http://www.123refills.com.mt/maps/maps.aspx. Or call ahead at 21384913. Now servicing all popular ink and toner models. Did you know that 123 Refills sells a wide range of printer cartridge components? These cartridge components are used by professional remanufacturers to assemble and remanufacture ink and toner cartridges. This includes OPC drums, Gears, Wiper Blades, Doctor Blades and other cartridge parts. PCR's and Mag Rollers too. Follow 123 Refills at twitter.com/123_Refills and get timely notifications of product alerts, coupons and inkjet / toner news alerts. 123 Refills is one of the largest ink and toner companies on Twitter with more than 5,000 followers and growing. Click on the "tell a friend" link on the bottom left of the home page of 123 Refills to send a message to a friend, and both you and your friend will get a 5% off coupon sent by 123 Refills. This will be a limited time coupon and can be used once per person. Send the coupon and referral to as many friends as you like. You can also subscribe to the 123 Refills newsletter and get monthly emails with new product alerts and promotions. Did you know that the cost of inkjet ink to a typical consumer (per ml) is about 400 x the price of Evian water? Printer manufacturers make their money by selling high priced cartridges (consumables). The printers are sold for cheap, sometimes at or less than cost. It is equivalent to the razor / razor blade theory. Get the razor cheap (or free), and you're stuck buying expensive consumables for it. Same thing with ink. Some printer manufacturers have tried to buck the trend. Take Kodak for example. Kodak is selling higher priced printers and cheaper cartridges. But even Kodak isn't much different. It is true that the Kodak cartridges are "cheaper" than other printer cartridges, typically costing around $10 for a black cartridge or $15 from a color cartridge from a Kodak authorized reseller like Best Buy. However, take a closer look at how much ink is in those Kodak cartridges. You'll find its around 1/2 the volume of ink than more expensive HP inkjet cartridges for example. No surprise then that there has been a recent push by regulatory bodies to force printer and cartridge manufacturers into labeling their products more visibly with the amount of ink that they hold. The National Conference on Weights and Measures for example has been pushing for tighter restrictions on the way printer ink cartridge manufacturers must label their products. This may in the long run put pressure on ink prices, which won't be a bad thing for the consumer. 123 Refills has long been promoting more ink and more toner whenever possible in the same cartridge shape that OEM cartridge manufacturers would put less ink. The 123 Refills compatible cartridges for Brother LC51 for example hold up to 4 x the ink volume as compared to Brother OEM cartridges. The HP Q2612a toner cartridge can also hold about 50% more toner than HP puts in their cartridge. Many brother printer cartridges also hold more toner than is first sold with the cartridge when you buy a new printer. The Brother TN460 is an example. Sounds like a great concept... inkless printer and rewritable paper. But at what cost, and at what quality? It would be unfair to speculate about the quality (except to comment that its targetted for "documents" which require less resolution of course and have less quality concerns than regular home or office printing jobs), but we can talk about the cost since Sanwa (the manufacturer of this ink less and toner less printer) has published that it will probably be priced around $5600 per printer and the paper at $3360 per lot (1000 sheets of paper per lot). 123 Refills has reached more than 5,000 followers on twitter, making it one of the most followed after-market ink and toner cartridge and refill reseller on Twitter. Easy Group was awarded a research award by the US ARMY for its efforts in developing a complete visual and Near Infrared (NIR) reflectance inkjet camouflage management system. Its NICIA (Near-Infrared Chemistry Increased-Load Adaptive-flow Ink and Software System) has been selected for award in response to the U.S. Army's needs for a fast turnaround system that enables rapid camouflage item production for pattern evaluation purposes. 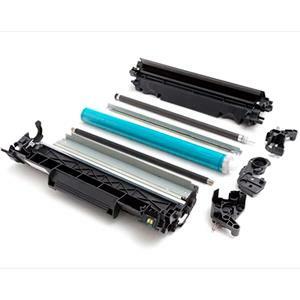 Refill kits for Samsung laser printers. Includes monochrome Samsung such as Samsung ML-1710, ML-2250, SCX-4200, ML-2850, ML 2151, ML 4050 / 4550 / 4551 (20,000 page yield, high capacity), ML 3050 etc (with and without chips needed for refill). Also color laser printers such as CLP300, CLP310, CLP350, CLP600, CLP660, CLP500, CLP510 and more. Brother Continuous Ink System Bundle now available, get a $979 value for less than $200. Over 40 cartridges worth of ink + a Brother inkjet printer for $200. This is an incredible value deal, and makes sense for just about any home or small office use. The printer is the Brother IntelliFax - 1960c Color Inkjet Printer. This printer boasts a full-color fax and Message Center solution with a 5.8GHz cordless handset and built-in answering machine. Ideal for small office or home office environments, it’s a perfect communications tool that delivers impressive fax, phone and printing features. Among its features are a 5.8GHz digital cordless handset, High speed 33.6K bps SuperG3 fax modem, 16MB memory and more. This printer has an estimated street price of $169.99 by Brother, and comes with 1 cartridge per color (black, cyan, yellow, magenta). Consider that each cartridge holds around 12ml of ink. Thats the equivalent of around 40 cartridges worth of ink PLUS the printer, all for under $200. If you bought 40 cartridges, those would run you over $700. Add the cost of the printer, and you'd be around $1000. So its really like saving around $800 worth of ink! Kodak inkjet sales helped push Kodak into a profitable quarter. Kudos to Kodak for selling lower cost ink compared to other OEM ink resellers. Although Kodak ink cartridges are cheaper than others like HP or Lexmark, they also hold much less ink than the average HP cartridge. Good marketing and a good concept, but still expensive. 123 Refills saves its customers about 1/2 the price compared to Kodak ink. Choose from any product in the ink and toner category (inkjet cartridges, toner cartridges, ink refills or toner refills) and get the 10% off as long as you order by Feb 10 2010. Not valid on original brand inkjet or toner cartridges. 123 Refills has over 4,000 unique products for sale on its site making it probably the largest online superstore for ink and toner with its own distribution facility out of Los Angeles, CA for quick and accurate shipping across the US.